I never said that personal taxes are less that corporate tax. My point, very clearly, was that millionaires have the means to not pay the same level of taxes as you and I do. And my comment was not preposterous at all. Why wouldn't the gov't want more personal tax dollars? Why do they often push striking union workers back to work rather than forcing the companies to give in to their salary demands. The doubling salaries comment was an extreme embellishment, but using your logic means that gov't would want workers all over to get a bigger piece of the pie. It doesn't work like that. The revenue sharing is only one piece of the missing link. I don't think the players will toss our arbitration or go 10 years until becoming a UFA. But the financial piece is likely the biggest sticking point today. I would be surprised if most players are not incorporated...why would they take all that money as personal income? It makes no financial sense to do so. I am probably in the minority who believe the NHL and NHLPA are not as far apart on numbers as everyone else on pickuphockey seems to think. I believe the players are concerned more about other issues and will probably table a counter proposal after the other issues are dealt with. It makes more sense from Fehr's prospective to make the owners sweat it out till close to the end of the CBA, keeping the players as the good guys in the media. The longer it runs with a season still possible, the better the numbers will look for the players. The players can still earn an income during a lockout, but the owners cannot, unless they ice replacement players. I don't think a lockout favors the NHL this round of negotiations. Too many leagues chomping at the bit for NHL caliber players and I believe this would do more harm to the owners than good, should they choose to lockout the players. Did anyone notice the big money loser on Beans list of teams is Pheonix. Losing $22 million and league run at 20% of the total of all the Owners losses come from a team that Bettman and the League run. Sure doesn't highlight Bettmans business acumen does it. You take out what the League lost running a Franchise in the desert, and Columbus who cant seem to win or draw a crowd and the picture doesnt look so bleak. Total combined loss for the 2 worst financial teams in the league is $38 million or 30% while the remaining teams on the bottom half lost $88 million. Hell, all of the losses on the losing teams doesnt even equal the profits of just the leafs and Canadians. You want to increase profits Bettman? Stop preventing the relocation or expansion of another Toronto, Southern Ontario or Quebec team and stop pushing hockey in a low profit market. In looking at Beans list of teams' revenues and profitability, I noticed that the two Stanley Cup finalists both lost money. (Well - the Kings only lost $200k, which is about break even.) The Devils are shown to lose $6.1 million, which would have been significantly more if they either missed the playoffs, or if they were bumped out in the first round. And did the Oilers really make $17.3 million without making the playoffs? I shouldn't be completely surprised. The Oilers sell out every game, and they have one of the highest average ticket prices in the league. But still, their overall revenues ($96 million) are 15th in the league. So there has to be another reason for their profitability. And that reason is that the Oilers (according to the information provided by Beans, and assuming my numbers are correct) have the lowest non-player costs in the NHL. How is that Calgary spends more than twice as much as the Oilers on their "non-player" expenses? I suspect the Oilers have a much better rent deal than the Flames. But does this explain the difference? And to Joshua's point, how did the league-run Coyotes spend approximately $40 million in non-player costs? For the teams that spent the most, at least all of them made money, and some of them, a lot of money. As for the Coyotes, they should have been run on a shoe-string budget (perhaps with the exception of hockey talent, which you need to be successful), but of the 15 bottom teams in profitability, only three teams outspent the Coyotes (as run by the league) in non-player costs. To lose $24.4 million on revenues of $70 million is ridiculous. Look at St. Louis. Their revenues were not a lot more than Phoenix, and with similar spending on player talent, the Blues had a heck of a season on the ice, and only lost $2.7 million. Some teams are well run, some are not well run at all, and lots of teams are somewhere in the middle. Should the players be responsible for mismanagement? Coyotes spend quite a bit on travel. They don't have teams they regularly play almost within walking distance, like NYR or Leafs, for example. why do you automatically equate "high operating costs" with "mismanagement"? - level and scope of community involvement, as well as geographic range. - rental costs (as you've mentioned), overall stadium and facilities costs. - number of "ambassadors" on staff (I'm thinking more of Toronto and Montreal here, who employ many ex players as part of heritage initiatives. Some cities are also more expensive to operate in than others. The teams you mentioned at the top - BOS, NY, MTL, TOR, VAN - are some of the most expensive cities in North America in which to do business. They also all have their stadiums in the downtown core of some of the highest value cities in North America, which means property taxes are significant - I shudder to think what the annual taxes are on MSG, which is located right in midtown Manhattan on top off Penn Station . If you're a team operating in a high cost jurisdiction and it costs you boatloads more money to operate, does that mean you're mismanaging? Nuxfan – if you think I believe all teams are mismanaged, you are mistaken. As stated, I believe some teams are well run, some are run poorly, and a number of teams are in the middle. If you think all teams are well run, I have to disagree. But I actually think we agree. And yes, I agree with you that some teams have extra costs. I'm not sure how much it costs to employ ambassadors. But let's say the Canadiens have 5-6 of them. I hardly think this adds up to a lot. Take a guy like Guy Lafleur. They might pay him $100k a year to be an ambassador, but maybe I'm mistaken. Getting back to some of the differences in non-player costs, can someone explain the differences between these costs between Calgary and Edmonton for example? As it relates to Edmonton, I highly doubt they made $17 million in profit last year, but I have no evidence to dispute the numbers provided by Beans, as were provided by Forbes. Another thing with non-player costs. Some teams may (emphasis on may) include costs which the NHLPA would dispute as allowable expenses, costs which may more properly belong to another business owned by the team owner. I just think some of the numbers don't make sense and/or that it demonstrates the differences and efficiencies to how teams operate. Once again, some well, some not so well, and some in between. I have no doubt that many of the owners pump up expenses and make it seem they are barely scraping by or losing money . . . to their benefit tax-wise, team-wise and public perception-wise. I also have no doubt that some teams are in fact losing a lot of money. But folks, let's keep the discussion on track with the CBA, and potential lock-out. It was very interesting the offer put forth by the players today with regards to revenue sharing. TSN said the offer has the players asking smaller revenue share (not 57% but they did not reveal the number), with any new revenue growth going right to the owners and not included in the players share. So the players would keep 2 billion, while should the NHL grow at the same rate it could be 800 million more in the owners pockets over the same period. I think thats a pretty interesting starting point for the players, they recognize the owners want of making more profits and they limit wage loss to themselves. So if the NHL continues to grow its revenues on the same pace, it will put more money in the owners pockets on a longer term basis. At least thats how I see it. I like how the players offer has both sides getting something they want unlike the owners proposal where the owners want to take money from the players to make immediate gains. I don't think it creates as wide of difference as most were expecting but I think the owners are still going to be looking for more immediate gains. Certainly the players offer was not as go for the throat as the owners offer was. I have a new respect for Donald Fehr and the NHLPA. This is a legitimate offer and puts the onus on the owners to fix their own issues. The offer of a very clear and structured three year program for the salary cap gives the NHL and the owners ample time to figure out a structure to be profitable. I think the option to go back to the 57% in year four is still rich, but I think this plan give all parties involved a way for both sides to win. I didn't expect something this reasons my the players and I think this also sways public opinion in the favor of the players more than the owners. The next week will tell us if we are watching hockey in October. The NHL holds the hard line, good night to the season starting on time. Me too - an interesting move on the part of the NHLPA. Too few details to really say one way or the other, but its definitely different. However, I think the reversion to the 57% in year four - the decision for which is solely held by the NHLPA - will be a sticking point. What owner is going to let the players decide how much of their pie they're going to eat? It was also mentioned that the NHLPA did not include any provisions around contract length/size or RFA time. While not the biggest issues, I do think they are issues and the owners will want to see dealt with. It sways the public opinion quite a bit towards the players. Donald Fehr has done a marvelous job. I think I said it earlier in this thread when I did not like the NHLs proposal, real negotiations aim for a win win situation. The players have made an attempt at doing just that. The words the players are using are bang on too, I think it was Crosby in an interview saying the players recognize their responsibility for success all teams in the league, big market and small market. They are willing to do their part to help them. Another thing, you have not heard the players use the work lockout once only Bettman has come out and said the dreaded lockout word. Bettman has been using old school negotiation tactics using demands and hard lines. Fehr has his players being out front, using interest focused tactics. I don't think Bettman is taken aback or on his heels but he may have been forced to relook at the image the NHL is projecting compared to the players. Nuxfan, I think the players have left the issues of contract length/size, RFA status as bargaining chips to get their revenue sharing plan. I also think that if the owners accept the terms of the players revenue sharing plan it will still not return to 57% after the 3 yrs. I have been impressed by Fehr, and what he has obviously established and coached everyone on in terms of focus, public statements, and tactics. Very impressed. I do believe Bettman has either met his match, or he will have to elevate his game. What a great catch by someone to point out that not one player has said the word "lockout". That is no coincidence, my friends. That is a specific tactic. Also, no off the cuff comments from any player or rep - not even a smidgeon. Everything careful, measured, even. Crosby was even blander than usual, and that's saying something! The counter-proposal for the public seems somewhat reasonable . . . and certainly, for public perception at least, it's a great move by the NHLPA. How much these negotiations are actually driven by what the public thinks remains to be seen, however . . . in the end, Bettman has gotten what he wanted many times with everyone having a very negative opinion of him in general. Still, it's very interesting to see. Curious to see what the Count gives as a counter-counter-proposal. 1. you have a system where salaries are no longer tied to revenue - this is a dangerous system to have in place, and AFAIK no business can run this way. Its OK when times are good and hockey revenue is rolling in, but its not good when times are bad or if teams begin to struggle. 2. There is no provision for decrease. What happens if hockey revenues decrease over the next little while, either because of hockey related or macro-economic issues? Does the cap come down? - As far as I can tell, this CBA would build from today - where players current recieve 57% of HRR - and only goes up for the players. I'm not sure how that addresses any of the owner concerns. Again, because no details were released to the public, its hard to really get a good feel for exactly what the players are proposing, and all the ins and outs. Will need to hear a lot more in the way of details. Porkchop - the "alternate universe" proposal from the players did not contain any changes to current contract rules, which means they are effectively rejecting the NHL's proposals regarding contracts. Which means they want to keep the current rules, not hold them as bargaining chips. Also, what makes you think that the players will not revert to the old CBA after 3 years? Just a gut feeling? Players can be just as greedy as owners when it comes down to it, and thats a big chunk of pie. A good article that gives some insight into the player proposal. Nuxfan, interesting and very informing article. I might need a little help to understand how the decoupling of the salary cap from the HRR is happening. From what I am reading the players are agreeing with the hard cap the way it exists today. That cap is already tied to the hockey revenues. So why does that change if the players agree to it. The players view did not touch the cap. So the players accept a lower revenue share for three yrs, the owners keep all added or new revenue for the next three yrs and the cap moves accordingly as it always has. The players view gives the owners a decision on how they want their money. When consider the other tidbits the article included about NHL growth and an optimum time for it with a new NBC contract, there is some weight to the players view of how the owners could make their money without taking a huge chunk away from the players. Is it the perfect answer, no, but I think the key messages from the players are being overlooked. One - the players have acknowledged they will make concessions and recognize that they play an important role in all the teams being financially successful. Two - the players are telling the owners with their view that the owners need to step up and do their part to make sure every team is succesfull as well. I am waiting to see what Bettman and the owners will say. Of course it will not be accepted. If you go by the proposal from the owners and the "alternate universe" view from the players, then the two sides are still quite a ways apart. My bet is Bettman will say "the players view is not aligned with the owners and then comment on how they need to come with a real proposal". It will be a hard line insinuating the players have to come back with someting else. The owners should play the same game as Fehr and the players are otherwise it is going to look a lot like greedy owners instead of greedy players. Also, nuxfan, the players could still easily use contract lengths and terms etc as a bargaining chip. Of course they don't want it but they know from the owners first proposal that it is big on their list of wants so you keep it in the back pocket and maybe agree some terms in contracts if the owners agree to something the players have brought forth. I would think that if the players can limit salary loss, they might be willing to budge on contract terms. My Opinion, the ball really is the owners court and how they react is important. Do they come out saying they are willing to work with the players to bring the ideas closer together or do they just say the players need to come back with something else. There are two different styles of negotiating going on here and its very interesting to watch. This hockey related revenue/salary cap concession being suggested by the PA is smoke and mirrors. Its a complete perception ploy and is garbage. It's basically saying the owners must get the financial pieces right because after 4 yrs they will go back to the full 57%. Furthermore, if you take the players proposal and put it into the current model, it only moves the needle from 57% to 53%. Hardly a concession at all. Fehr sent a memo to the players that was also received by a media guy and it clearly stated that the PA will not entertain any changes to the lengths or structures to the current player contract. Regardless of the HRR thing, if the player contracts are not limited in length and even salary for each year than nothing will change. If the players are so interested in long term stability, why suggest only a 4 yr CBA? Nope, it's lips stick on a pig. As far as Slozo's point on Bettman meeting his match or stepping up his game, I think you are forgetting that no commissioner in the history of any pro sport and successfully lead a league through as many labour disputes as the count. He is firing his guns(as told today with his comments about the two teams seeing two different worlds), has already stated je will lock out, and he currently has and had had the fully support of the owners for 2 decades. Nope, Bettman is still the winningest negotiator in sport. Fehr is not there yet. One strategist today was saying the players are in a good spot likely throught October. Oct 12 the PA has to play last year's escrow cheques, slated to be 12% of the salary for last year. He also stated NBCis rolling out their hockey schedule after American Thanksgiving. This guy estimate the league is back on the ice for Nov 23 which will give the league 5 weeks of prep before the winter classic. Sadly, every person I listen to today said hockey starting on time is highly unlikely. From what I understand, it quite simply means that the salary cap (and raises to the salary cap) will no longer be dependent on league revenues. The cap will stay at 70M, and rise 2% per year for the first 3 years of the CBA. If league revenues rise 50%, the cap will stay the same and the owners will make buckets of money. If league revenues drop 50%, the cap will stay the same and the owners will lose buckets of money. The amount of money that teams were obligated to pay players would no longer depend on how much money was being made. Owners are throwing cost certainty out the window. I highly doubt owners are going to go for this. Three - we the players will give you 3 years to get your house in order, after which point we'll go right back to 57% of HRR in our pockets and have the same league as we have now. This is why its not going to fly. I agree with Beans - now that more details of the deal are coming out, this is lipstick on a pig, and a lot of smoke and mirrors on the part of the players. They are desperate to keep that 57% of revenues, because anytime they lose some revenues, it resets where they start from in the next CBA bargaining session. If they go down to 50% in this deal, when the next CBA comes up they're negotiating from a starting point of 50%, not 57. And it goes on and on. They think that the NHL owners will suddenly get on solid financial footing in 3 years time, and they can then go back to everything they have now. It doesn't work that way - the owners know it (and I think the players know it as well) and it will almost surely mean labour strife come 2016. - allowing weaker teams to trade cap space to richer teams, in return for drafts or money. - giving financially weaker teams additional draft picks to help them out. Granted, I'm only reading snippits, but from what I've read so far the NHLPA is being delusional with this proposal. They think that the NHL owners, after decades of planning and building teams and an entire league with method A, are suddenly going to toss it away and choose method B in a matter of 4 weeks? I said a lockout was likely, and now I'm almost certain that its going to happen. I think they'll come back before Christmas as well, if only for the outdoor classic - but at this point anything could happen. I totally missed that, but you are wrong about cost certainty. It gives the owners 100% cost certainty because the players would be taking a 2% raise the first year, 4% raise the second year and a 6% raise in the third year. The owners could very easilier figure out their player salaries 3 yrs in advance giving them several options at creating revenue based on those fixed costs. Very similiar to how you and I would get raises. I would think the owners would love this aspect of the proposal but I do agree proposal is a lot of smoke and mirrors. Although I think its still very smart. Of course there is no way the owners will accept it. I still like the message it sends to the owners though. Like you said, it is telling the owners to clean up their own house, big money teams stop messing with small money teams, help each other out and we will help out too. Doing it with the proposal the players gave is a bit unrealistic but the owners should look at that message and find something from it. If it was a long term solution hn I old agree Chop. But it's not. Th fundamental issue with the current CBA is that 57% of HRR going to the players is unsustainable. Holding that off for three years to bring a fictional cost certainty doesn't change that. It's like say the league has parity because teams are closer based on points when those points are given out for losing. Good point, you are correct it does give them cost certainty, I misspoke. What I meant to say was that it does not give them the ability to alter their costs based on revenues - when you decouple salaries from actual revenues you're entering a world of hurt. In the real world, if revenues drop, companies react - cost cuts, layoffs, outright closure, whatever. Having a cap that is out of touch with reality is no way to grow a business. There is certainly upside to this sort of deal - if revenues were to explode upwards the owners would indeed make tons of money. However, if revenues stagnate or even go down (which is a possibility), they have no way to control the biggest cost to their business. to be perfectly honest, all the details of the CBA with me go in one ear and out the other. to the players, and the owners, and i suppose even to some of the fans, this is all very important. but its all lost on me. i say just get it f'in done! let's play hockey!! but i do have one question for both the owners, and the PA. the current CBA is set to expire in one month. and when that happens the league will lock out the players. no ifs and or buts. and apparently this is something that neither side wants to happen. so if that's the case, then why in the name of all things big and small is the next meeting between the two sides set for NEXT WEEK?!?!?! as noted above i'll be the first to admit that i'm not the sharpest tool in the shed when it comes to the CBA and its negotiations. but even i know that if its so important to both sides to avoid a lock out on on Sept. 15th, then head to head meetings need to happen more often....like every day! especially if the two sides are as far apart as Bettman says they are. forget next week. you meet tomorrow, and the next day, and then the day after that. hammer this thing out! get it done! give us hockey! easier said then done? perhaps. but waiting another week just puts us all one more week closer to that lock out. and let's be honest, we all know that when they meet again next week there will be little to no progress made. at which point they'll wait another week to meet again. and that's just not good enough. not at this stage of the game. Very interesting article Nuxfan! Thanks for passing it along! I was particularly interested to see the article describe that after you take out the top three teams in profitability, the remaining 27 teams combined for $44.4 million in losses. So that leaves 8 teams who made decent money, and one could argue that Colorado ($6.1 million) and Chicago ($8.7 million) had okay profitability last season, but still less than the highest paid player in the league. But one's opinion depends on one's perspective. If you think that owners of sports franchises don't care about losing money, and the hobbie's the thing, that's understandable. responsible for their own plight, that's also understandable. But with a lock-out looming in 30 days, I would suggest that the team owners want a bigger piece of the pie (how's that for stating the obvious), and that's what they've deputized Gary Bettman to do. And while most of the owners have other businesses (or fortunes) which underwrite losses (or minimal profits) which many NHL franchises appear to be experiencing, most business owners don't like losing money. And while both sides have lots to lose with a lock-out, I would venture to say that the players have more to lose. I also liked the article Nux, and 4 of the 5 make total sense. I am not a fan of a luxary tax systems and when looking at it from a non-monetary standpoint, it is horrible for a league. There is a reason the the baseball and basketball playoffs are always the same teams and that is because they do not have a hard cap but a luxury tax. The NHL (although inflated through loser pts) and NFL have the most parity in their leagues because they have a hard cap and/or non-guarenteed contracts. I would love to see the NHL actually step up and say we will give more than a 50-50 split AND a player contract can be cancelled at any time. Oh ya, also sign a 10+ yr CBA. Wait a second, I just described the NFL system. You know, the richest pro-sports league in North America?? Can't believe no one seems to have a problem after the planned meeting to move ahead with negotiations, was cancelled today after a short meeting with 2 head members of both sides of the CBA negotiations. I have been following every story I can read with regards to both sides of the negotiations and I can't figure out if there is any progress or not going on. Large differences, say both sides, and yet no player plans on the impending lockout. Are the players and reps not taking a lockout serious. I read today that owners are considering the NBC contract as income earned for 2012/2013 at $200 million to be in some cases better than the income earned thru actually playing a season and paying player expenses. NBC would be rewarded with an additional year of coverage at no expense and the 10 year contract gets extended to 11 years. Teams like Pheonix and Columbus might actually have balanced books should they actually lockout the players. The big losers would be the fans and the revenue teams who actually make a profit if the team plays. The owners get to make additional non hockey revenue due to open book dates in there venues. I am starting to think the CBA problems are truly between have not teams and teams currently making a profit under the current economic structure. Chiming in on the Owner side, the players reps need to get aggresive on cost cutting "now" if they want the have not teams to agree to play this year. There is no second north american league for them to earn an income and build there worth here and Russia/Europe can only handle so many NHL players. Chiming in on the players side, I am pissed the NHL owners are continuing to sign players under the current CBA rules long term, knowing full well they are signing a contract with numbers they intend to take backwards by as much as 23% in 3 short weeks. Its retarded that any player would sign long term prior to the CBA negotiations being finalized. 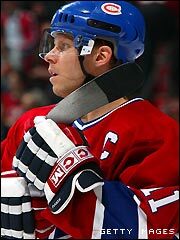 If I was lucky enough to have hockey skills enough to play in the NHL, I would be smart enough not to sign a long term contract which payed me a moving number such as the owner are presenting and sign short term giving me a chance to renegotiate after the CBA negotiations were finalized. Just stupid in my opinion to lock in 6-7+ years knowing the owners intend to pay less and remove arbitration rights should skill exceed pay. As it relates to the league looking at earning $200 million in the event of a lock-out. How in the world do the expect to earn tv revenues if no games take place? Would NBC really be contractually obligated to pay this amount for the 2012-2013 season? In essence, paying in advance for services rendered. I think the NHL is throwing this out just to make it look like they could be better off in a lock-out situation. Just part of the negotiating tactics really. Let's play some hockey already! Bettman has said more than once that he warned the NHLPA that the owners would not play this upcoming season under the existing CBA, up to a year ago. Given that Fehr has not rebutted the claim, I tend to believe it. If that is the case, then either the NHLPA thought that the NHL was bluffing on a lockout, or they did not realize that the gulf was as wide as it is and a new CBA would be relatively easy to negotiate. Either way, its pretty poor planning on the part of the NHLPA. Again, there are three sides to every negotiation. There is so much media posturing in these situations it's not even funny. Things have been reasonably peaceful to this point but you can see the claws are starting to come out. I was listening to the Oilers radio show today and I can't recall the guest on but they were saying it is likely the players were hoping to get into the new season before the CBA was signed. This would have given them one more year playing in the sandbox that was in their favor. The owners have been saying for a long time that the 2012/13 season would not go forward without a new deal. For that, I think there is some truth in Bettman's comments. But I wouldn't take anything either the Count or Mr "Fear" have said to the media at face value. It's all posturing and gamesmanship in front of the camera. I love it . .. "The Count" vs. "Mr. Fear" !!! I'd pay money to see that WWF-style wrestling match. From a distance, it appears that we are only at stage 2 of negotiations . "Re-posturing". - relatively speaking, both sides come to the table for the final effort to reach a deal. A deal is either struck, or decision to truly miss at least part of the season is made here. All that being said, I expect a bit of a stalling / frozen negotiations period at this point. This will be the time when all the pundits will say "prepare for a lock-out"! Although I believe the PA should have been open to negotiations sooner, there was nothing stopping the NHL from presenting an offer to the PA prior to opening negotiations. I can't even say 100% that the owner had not table there offer when they requested to open negotiations and that may be a reason the PA decided to hold off negotiations until just before the deadline. If the gap was that far off current income levels I would have presented it months ago so as to not lose a season. There has not been a lot of openess, up until now from either side, about the progress with regards to the cba negotiations. I am only certain of one thing, the NHL was the first to release its demands from the union to the press. The initial offer we are seeing from the owners, we all agree is way to aggresive, and if the owners haven't come to the table with a better proposal at this point, there is no reason for the players to keep presenting counter offers until they get to the owners numbers. Again, from what I read earlier on in the gong show negotiation process, the owners told the NHLPA nearly a year ago that they would not play under the current CBA, but the NHLPA told them they were not "ready to negotiate" until June of this year. I can't find the article anymore where Bettman said that, if I find it I'll repost. If that is the case, then both sides are at least partly to blame for where we are now. The NHL knew that they were going to be coming in with a contentious deal and should have known it would take longer than 4 weeks to agree. The NHLPA should have realized that the CBA would change (or a lockout), and should have alloted more time to negotiate one - there is no harm in having a CBA in place 3 or 4 months before the old one expires. I have been keeping my distance from responding to this topic because i do not like to comment on things a don't know very much about, but something that has been bugging me throughout this whole process was made quite obvious this morning with a 45 min meeting. My question is how much progress can be made with all these brief speradic meetings? I mean its seems to me with the september 15th deadline looming it is time for these people to sit down from 8 am untill 5pm with only a half hour lunch, (like most of us do when we're at work) and hammer out some sort or form of progress. It seems as if little to know progress has been made and we are moving ever closer to a lock out it's time for some work to be done, as far as I know the NHLPA has made one offer, Bettman said he doesn't consider what the NHLPA brought forward was even an offer, and the Owners have only made one offer aswell, is it not time to try something else? I want to watch hockey this year! totally agree Pasty. your comments here more or less echo mine in this forum from just a couple of weeks ago. last week they met for a whole 3 hrs (approx.) over the span of two days! and now this week they can't even get a full hour in before breaking up again? talks are hoping to continue this afternoon, but here's betting they'll break it off at 5:00. so another 3 hr meeting? and then they'll probably agree to meet again next week. three words come to mind: WASTE OF TIME! as of now that's all these meetings have been. are we sure that both sides are seriously trying to avoid a Sept. 15th lockout? because it sure as heck doesn't appear that way. Having been part of negotiations in the past, the part that most people may not understand is that rarely if ever is a decision made at the table. The conversation is generally to share ideas and provide the perspective/understand of one position compared to another. The heavy lifting in most negotiations happen between meetings. When each side has an opportunity to think and discuss suggestions and alternatives. A very good negotiator once told me is that if you ever make a decision while at the table, you will likely come out on the losing end of the decision. For that reason, I like the fact that both sides are meeting regularly and in short durations. It should mean there are a pile of ideas and suggests coming for both sides and each group must take those away to digest them. The other thing that I as well as most everyone not involved do not appreciate is the gravity of this negotiation. Not only does this the stage for the operation of the league for the next number of years but making decisions involving billions of dollars is something that most of us can not fathom. I'm personally fine with how things are going. The point of concern to me is when both sides stop talking all together. If you look back to Slozo's post talking about the different stages of negotiation, I think he nailed it. The parties are to at the point where a decision will be finalized. They are dancing their way thought the stages. Don't concern yourself that they are dancing to short songs. I have read today a report that during todays meeting the owners provided a 2nd offer which has similarities to the proposal the NHLPA proposed 2 weeks ago. The wording of this indicates the proposal submitted by the players seems to have points the owners seem to like. I believe the seperation from league revenue is a good proposal. If I was a betting man believe the owners would have countered with a proposal which would have allowed a roll back on wages now and the leagues wishes for contract arbitration/terms included in there proposal. I like that the owners are not singing the same song like the last CBA and look to be listening and flexible during this round of CBA talks. Would go a long way with fan support if the didn't hold a hard line this CBA negotiation. I think the PA proposal had a better fix it solution to the have not teams. In a related article I read a Business man has filed to build a new 20000 capacity rink in Markham Ontario. I believe the only team who could or would block a Markham bid for a competitive team would be the Leafs as they would be the only team directly affected by a team in Markham Ontario. I like that progress is happening in the face of a lockout as this shows that the game is still moving forward even though the possibility of work stoppage this year. Somebody must have faith that this will be handled soon. I posted a link to the Toronto Sun which indicates Bettman and the Ownership group have move closer to the NHLPA's proposal and are within $50 million of the revenue sharing the NHLPA had requested in there proposal. The PA is looking over what they call unspecific details which they wanted detailed more completely. Bettman is expecting this proposal will be taken more seriously and expects a counterproposal soon after todays meeting. Fehr didnt give any indication one way or the other but agreed to a meeting tomorrow after reviewing the proposal with players reps for 4 hours. There might be time for a preseason afterall. If, and thats a big if, Bettman and Fehr can pull off an agreement ontime, with as little bloodshed and hard feelings, I may take back some of my hard feelings towards Bettman. Details of the NHL's proposal are finally starting to be released. The NHL still wants to tie revenue to the salary cap. The current proposal offers 51.6 per cent in the first year of the deal and 50.5 per cent in the second—and wouldn't include a rollback on existing contracts. The 3rd year of the proposal would have the Owners and the players sharing 50% of the revenues, as expected, but will scale back the revenue sharing gradually. Not a bad compromise, but I dont understand why the league wants to tie salary cap to revenue. I believe the players proposal would have had salaries lower overall than the NHL's current proposal over the 3 year term. The option of reverting back to the current cba in the forth term being the only bad point of an otherwise better deal for the owners long term. Hopefully the players look favourable on this proposal or take some of the strong point of this offer serious and come to the table with a workable counterproposal.